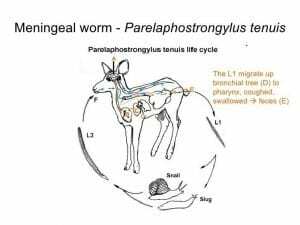 When I was a veterinary student in the 1990’s in parasitology class we learned about Paralephostrongylus tenuis (P. tenuis), the meningeal worm primarily affecting small ruminants, as an uncommon, even rare occurrence in private practice. When I joined Extension in 2015 in Hocking County, I found that for small ruminant producers in southeastern Ohio, this parasite was frequently encountered. P. tenuis is a type of roundworm that has white tailed deer as its primary host. In white tailed deer however, the parasite infrequently causes illness, but instead will live inside the deer for years with no outward medical signs, excepting only eggs shed from the roundworm into the environment within the deer feces. The life cycle of this roundworm parasite is classified as indirect. This means that further maturation of the parasite into an infective larval stage occurs in a second host outside of the deer and this intermediate host is then ingested by another species. The intermediate host for P. tenuis is slugs or snails. P. tenuis infection occurs when a susceptible animal ingests either an infected intermediate host or an infective larval form shed in the slime trail. Species primarily affected by P. tenuis include camelids such as elk, moose, llamas and alpacas as well as small ruminants such as sheep and goats. Rare cases of infection have also been identified in horses and cattle. I did not discover any human cases reported while doing research for this publication. The presentation of disease from P. tenuis is neurologic. Once a host ingests an infective larval form, the infective larval form moves out of the gut and starts migration within the animal’s central nervous system. If more than one infective larval form is ingested, multiple migrations can occur with potentially worse symptoms. Control measures for P. tenuis can be difficult as they include keeping deer away from pastures to prevent egg-shed contamination as well as preventing ingestion of slugs or snails. Compounding this is that a single deer can shed a large number of parasite eggs. If the producer has a pasture that is frequently wet or floods, they may want to consider baling this forage in an open time window. Another good management practice to minimize exposure would be to fence off farm ponds or wetlands so that small ruminants do not have free access to these areas. Some producers use small ruminants, especially goat, to manage invasive species in woodlots and this might lead to an encounter with the parasite. It is unlikely that slugs or snails could survive the drying process in making hay and it is unknown how long the eggs are viable if their secondary host dies in the hay making process. Slugs or snails may contaminate hay stored on the ground or fed on the ground as they feed on decaying organic matter. For this reason, it is important for a producer to locate an appropriate location to feed hay as well as keep stored hay off the ground. Veterinary treatment may include anthelmintics (de-wormers), anti-inflammatories and supportive therapy such as fluids. 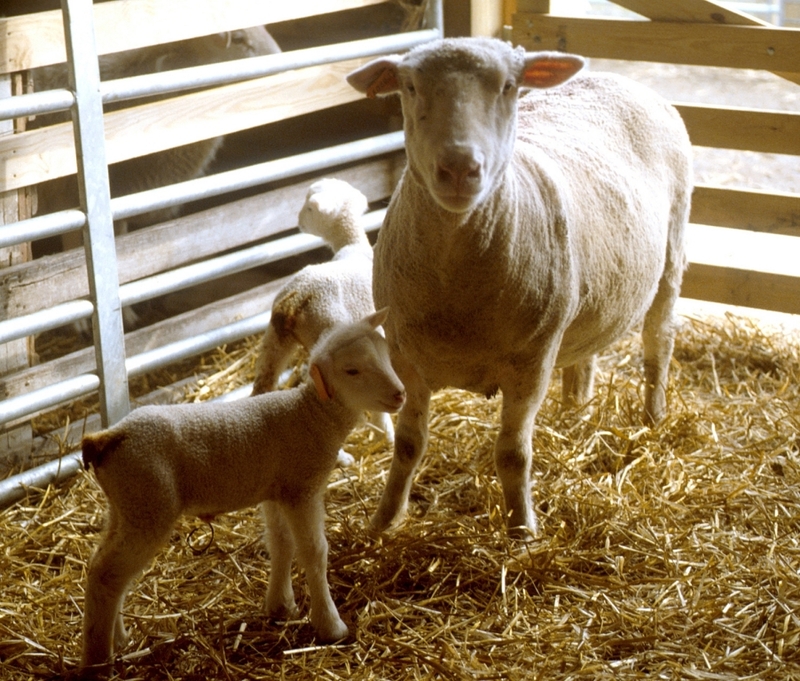 Preventative measures that include a monthly dose of an ivermectin-class de-wormer have been recommended in some cases of high-risk environments but a scheduled monthly dose regimen has been implicated in worsening the de-wormer resistance issues faced by sheep and goat producers to such parasites as Haemonchus contortus. This grazing season has presented many challenges to the small ruminant producer. Cold spring temperatures, large amounts of precipitation, short windows for making hay and wet and muddy pastures have affected management systems across the state of Ohio. 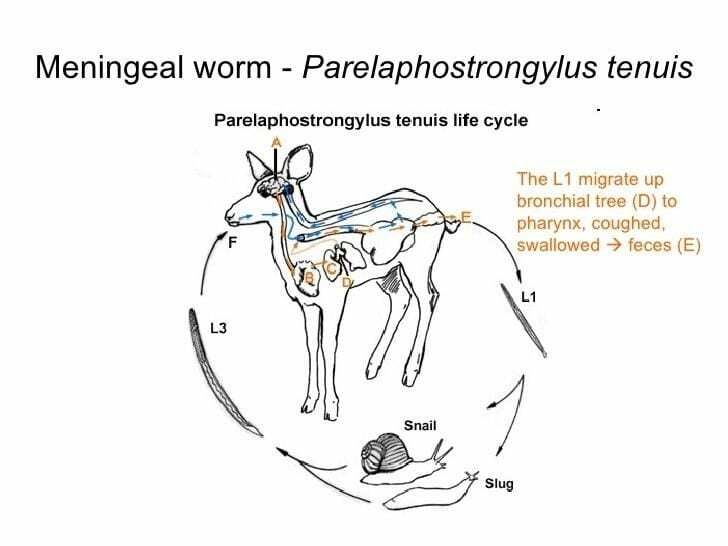 Compounding this is the increasing frequency of reports of Paralephostrongylus tenuis infections in small ruminants in areas with deer populations living close to pasture and forage ground. As this parasite is difficult to prevent, predict outcomes for, and no definitive testing is available except examination at necropsy, producers need to make sure that they keep this on the list of potential problems for a small ruminant herd especially if their farm is located in an area with any level of deer pressure. At any signs of neurologic dysfunction in small ruminants or other livestock, contact your veterinarian immediately. Many other neurologic diseases affecting small ruminants that can have a similar presentation include listeria, polio, neurologic infection or vitamin and mineral imbalances. The faster you contact your veterinarian and the earlier that medical treatment is initiated the chances for a successful outcome increase. Even with rapid diagnosis and treatment however, permanent neurologic disease is possible. Posted by Braden Campbell at 8:00am January 4, 2019 Posted in Health and tagged Health, Management. Bookmark the permalink.